With the finest quality of reception and service, this charming residence cultivates the art of hospitality in the French tradition. 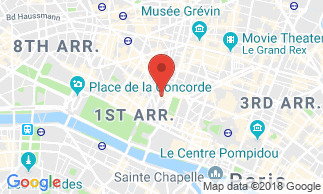 The hotel Louvre Sainte Anne is located in the heart of Paris, just a few steps away from the Grand Louvre museum and a few minutes from the Opera house. It offers you 20 refined rooms combining elegance and comfort. A charming residence in an exceptional location. The refinement of the hotel Louvre Ste Anne s 20 rooms, with their blend of charm, elegance and comfort, is your guarantee of a pleasant and relaxing stay. All rooms are equipped with a private marble bathroom (bathtub, shower, toilets and hairdryer), LCD-screen television with satellite, direct dial phone, minibar, private safe, and Internet access through data port or WIFI (free). Some rooms have a balcony. Enjoy an exquisite buffet breakfast served in your room or under the ancient vault. Breakfast not included : 14.50 EUR per person. For those who are in a hurry, we offer an 'Express' breakfast that is served in the room only. It includes a hot drink, juice and two small pastries. City tax not included : 1.88 EUR per person and night. Hotel Louvre Sainte Anne Opera I highly recommend this hotel. My room had everything I needed: a/c, quiet, a mini-bar/fridge, a safe, a hair dryer,a telephone. It was very clean and efficient. The best reasons for staying at the Ste. Anne Louvre Hotel are its wonderful location and, even better, its most helpful and kind staff. They are friendly and very nice, helping in any ways that they can. I will stay there again. Hotel Louvre Sainte Anne Opera Excellent value for money near the Louvre. Hotel Louvre Sainte Anne Opera Good hotel. The desk clerks were helpful and friendly. Breakfast was good. The location was helpful for seeing many sights of Paris.